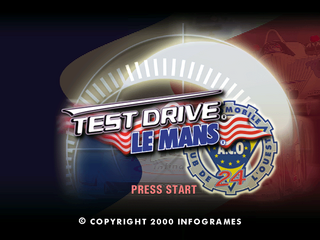 Le Mans 24 Hours (ル･マン 24 アワーズ), known in North America as Test Drive Le Mans is a racing game for the Sega Dreamcast published by Infogrames and developed by their Melbourne House studio, based upon the yearly 24 Hours of Le Mans race. It is not to be confused with Le Mans 24, a similar but unrelated game for Sega Model 3 arcade hardware, although coincidentally this game's Japanese release was handled by Sega. The game was later brought to the PlayStation 2 in 2001, this time having the Le Mans 24 Hours name on all regions. A year later it was brought to Japanese audiences, once again by Sega. Infogrames and Melbourne House Studios Would Like to Thank The Following Racing Teams and Trackside Sponsors for Their Help in The Making of Le Mans 24 Hours : Audi Ag And Audi Sport, BMW Motorsport, Chamberlain Engineering, Cirtek, Courage Competition, Doyle Risi Racing, Elf Harberthur Racing, Estoril Racing Communications, Fiat Auto S.P.A., GTC Competition, Jb Giesse Team, Joest Racing, Konrad Motorsport, Kremer Racing, La Filiere, Larbre Competition, Lister Cars Limited, Marcos Sales Limited, Momo Motorsport, Nissan Motorsport, Panoz Motorsport, Automobile Peugeot Et Peugeot Sport Pour Leur Aimable Collaboration, Philippe Gache Motorsport, Pilot Racing, Rolls Royce Motor Company Limited, Roock Racing, Sauber A.G., Team Augusta Racing, Toyota Team Europe, Toyota Motorsport Gmbh, Viper Team Oreca And Chrysler, Uu Net Deutschland Gmbh, Autocar Limited, Automotive Chemicals Limited, Bba Friction Limited, Bosch Automotive Limited, Bridgestone Firestone Europe SA, Cars And Car Conversions, Dunlop Tyres Limited, Elf Antar France, Esso Petroleum Co. Limited, Ferodo Limted, France Info, France Television, Jaguar Cars Limited - The Word Jaguar, The Leaping Cat Device And The Characters Xjr9 Are Trademarks of Jaguar Cars Ltd., England And Are Used Under License, Hawaiian Trop Tanning Research Laboratories Inc., Kenwood Electronics Limited, Lex Vehicle Leasing Limited, Michelin Etc, Mobil Oil France, Moto Journal, Ngx Sparkplugs Uk Limited, Petro Fina Sa, Sandtler Fabisch Motorsport, Tsw Alloy Wheels, Turbo Technics, And Yokoyama Hpt Limited. Main article: Le Mans 24 Hours/Magazine articles.